War is over. 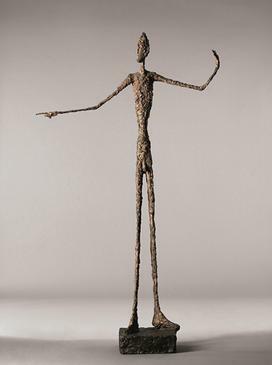 Alberto Giacometti appreciates that some new art is required and that his diminutive sculptures will not appeal anybody. His characters will be life-size. They will be threadlike as the floor lamps that the artist formerly conceived for Jean-Michel Frank. Pierre Matisse is interested and promises to organize an exhibition in New York in January 1948 of this art which, in October 1947, does not yet exist. The works must be designed and the bronzes have to be melt. The artist is in a hurry. The meeting with the agents of the foundry is scheduled for tomorrow morning. Alberto is not ready. He is not happy with his prototype and demolishes it. In a night of frenzied creation, he realizes L'Homme au doigt. When it is carried out for the factory, the plaster is achieved but it is still wet. Seven bronzes including an artist's proof are edited by the Alexis Rudier company. The man points the finger to show the way to the other two sculptures in the trilogy, the walking man and the standing woman. This horizontal finger is a sign of authority, hope and renewal. L'Homme au doigt emits the founding message before disappearing from Alberto's creations, unlike the other two figures that will accompany his whole career. The plaster was kneaded in a hurry, giving a tormented and scarred texture from which some observers said that L'Homme au doigt is Alberto's self portrait. One bronze, the number 6/6, was hand-painted by the artist. It strengthens the resemblance. The pointing man is not God between Adam and Eve, he is Alberto, the creative artist. This number 6/6 178 cm high is the most outstanding piece of bronze by Alberto. It will be sold by Christie's on May 11 in New York, lot 29A. The press release of April 15 announced an estimate in the region of $ 130M. I invite you to play the video shared by Christie's. Zhang Daqian was a talented and prolific artist. His success is also due to his vocation for teaching, which makes him simultaneously varying styles and themes. In 1934, only aged 35, he is a professor at Nanjing University. His innovative processing of colors follows his scholar work on the frescoes in the ancient caves of Dunhuang. The lotus is the best subject to express this new research. On May 28 in Hong Kong, Christie's sells as a single lot a set of four hanging scrolls made ​​in 1947, 154 x 78 cm each, showing lotus in ink and colors. Here is the link to the catalog. The various compositions reflect the imagination of the artist, but the color treatment is the most remarkable. The four works are indeed very different, ranging from classical discrete tones to a sumptuous juxtaposition of color washes. The most colorful of the four images is very close by its color harmony to a scroll from the same year, 185 x 95 cm, which was sold for HK $ 190M including premium at Sotheby's on May 31, 2011 over an estimate of HK $ 15M. The expected price at Christie's for its lot, HK $ 10 million, does not take into account such a similarity. Forget the estimate and only keep in mind the excellent result: HK $ 80M including premium. Luxury cars of the 1930s give the impression of an infinite variety. The chassis was entrusted to skilled bodybuilders who competed with each other to attract wealthy clients. World War II slowed their art without stopping completely, as evidenced by a 1947 Bentley available in the sale organized by Barrett-Jackson in Scottsdale AZ from January 15 to 22. This Mark VI model has a rare feature: the chassis has been sent to France to be coachworked as a convertible cabriolet by Franay. The result is interesting. The elegance of the lines is English, but the powerful look is in the fashion of the massive French cars of that time. This Bentley looks like a Delahaye. I have found it again on the web (with the same plate!). It was sold for $ 1.7M including premium in the sale heldf rom March 30 to April 1, 2006 in Palm Beach, also by Barrett-Jackson. Here is the link to the catalog. The gain in six years is remarkable. This car was sold $ 2.75 million including premium. The cosmopolitan culture of Wifredo Lam anticipates the contemporary globalization. He was born in Cuba, son of a Chinese and grandson of a Cuban mulatto with a Congolese slave. His godmother is a voodoo healer. The sensitivity of Wifredo Lam is not mystical but social. Republican fighter, he met Picasso after Guernica. He will populate his paintings with fantastical characters in hybrid forms combining human, animal and plant without forgetting the aesthetic influence of African fetishes. His surrealist compositions convey a political message in favor of the Third World, guided by titles that are often linked to the Yoruba mythology. The all-powerful figures announce a different world. On May 26 in New York, Phillips sells an oil on canvas 100 x 100 cm painted in 1947, lot 25 estimated $ 2M. Simply titled Présages, this artwork has the characteristics of a fantastic and multiple nativity. A cluster of four small spheres of which two are horned is coiled in one of the leafy arms of the creature who is necessarily the female. The being who flies over the scene like a pterodactyl is the father. A little further, a third character with the triangular head of an African mask attends the event. Premonitions (Présages) of freedom actually appeared in 1947 with the end of the colonial period in India and Palestine, two years after the end of World War II. The Brooklyn Dodgers were among the best baseball teams. In 1947 for the 7th time in their history they were champions of the National League. On that year their success had a historical dimension : for the first time, thanks to the obstinacy of their general manager Branch Rickey and to the courage of Jackie Robinson, the race barrier fell in one of its most protected strongholds, the Major League Baseball. At the closing ceremony of the championship on September 23, 1947, a photo shows Jackie in a baseball uniform alongside his wife and a friend. That game worn jersey was treasured for half a century at first by Jackie and then by his widow. A great symbol of the movement that will lead to racial equality in the United States, it is sold without reserve price as lot 50001 by Heritage in Dallas on November 19 in an online auction with extended bidding. The bidding starts at $ 900K with a $ 3M guide value. The 1947 season ends from September 30 to October 6 with the World Series where the Dodgers are defeated by the Yankees in the seventh match. Rickey's choice had been relevant : Jackie Robinson was able to resist all insults up to and including the MLB's most prestigious event and his sporting qualities made him named Rookie of the Year. Please watch the video shared by Heritage. The great project of Matisse was to bring a new meaning to art by the choice of colors and the simplicity of lines. La Danse, painted in 1909, appears as a prototype of his evolution at the end of his career. Jazz, edited in 1947 by Tériade, marks the triumph of his new technique of cut papers. It is however only one of the elements of the restart of the theories of the artist for a joyous art that seeks the sublime, escaping henceforth the conventions of painting, sculpture and drawing. Helped by his very efficient assistant Lydia, Matisse covers the walls of his studio in Vence with his new realizations of which he constantly modifies the positions in search of a soothing balance in the global effect. Not only did Matisse reach abstraction but he also anticipated the monochromists of the following decade. The stiff paper is covered with a monochrome gouache in the expressive color desired by the artist. His large sewing scissors cut an abstract silhouette of harmonious curves in the middle of this plate which is then pinned on a cardboard of another color. When the artist left Vence two years later, the pins were carefully replaced by light dots of glue. On May 17 in New York, Bonhams sells a 41 x 26 cm abstract cutout made in 1947, titled Arbre de neige, lot 12 estimated $ 800K. Within the fuchsia-colored gouache, the hole on a white background evokes a tree-like shape with undulating edges. Another cutout of same size made in the same year was sold for $ 1,08M including premium by Christie's on November 4, 2013 in the sale of the Krieger collection. The comparison of the two artworks shows the diversity of the new inspiration of the artist : these Arabesques violettes sur un fond orange have shredded edges close to the violence of the abstract paintings by Clyfford Still. Please watch the video shared by Bonhams. In Paris, the English Leonora Carrington was close to the Surrealists. Very young, she had an affair with Max Ernst. When came the Second World War, she almost descended into madness, and then took refuge in Mexico where she married twice. She was a key personality of the intense artistic life of Mexico, where she still lives in the same corner after six decades. In October 1944, she pictorially celebrated her second Mexican marriage, with the Hungarian Chiki. This oil, tempera and ink 90 x 90 cm, French entitled "Chiki, ton pays" (Chiki, your country) was sold 420 K £ including expenses by Sotheby's in London in February 2002. It is again coming at auction, estimated $ 1.2 million, at Sotheby's in New York on May 27. A giant woman with a very small head occupies the left part of a fantastic landscape, completed with a pond that provides impossible reflections. The newlyweds dominate this dream scene from the top inside of a bright red draped mountain. This friend of Frida Kahlo is definitely one of the discoveries of this spring. The theme of the small headed giant woman is the main subject of a tempera on panel, circa 1947, 120 x 69 cm, estimated 800 K$ by Christie's in New York on May 28. For "Chiki ton pays", the market did not follow the arguments of the auction house on the importance of the work. This painting has not been sold. Surrealism is too complicated to interpret, and it is increasingly difficult to achieve high prices there. Wait now Christie's lot, less important in the work of the artist, but also less difficult to decode. There is no doubt, it is the surprise of the day. Christie's sold their painting, $ 1.5 million including expenses. This result, well above the estimate, is also higher than what Sotheby's was waiting on Chiki. This Giantess, also called the Guardian of the Egg, is as dreamlike as Chiki, but the simplicity (and thus the strength) of its design enabled it to succeed. The history of clockmaking is a continuous series of inventions supported by the skills of the best craftsmen and manufacturers. Amidst many other improvements Abraham-Louis Breguet is the inventor of the tourbillon : the escapement and the balance are mounted in a rotating cage to counter the variations in gravity. The twentieth century had great advances in the miniaturization, encouraged by trials organized by the observatories for granting their official certificates. After the second world war, the wristwatch category of these competitions is applicable to mechanisms less than 30 mm in diameter, without assembly requirements. In 1947 Omega enters to the observatory trials the miniaturization of the tourbillon with twelve identical mechanisms under the reference Tourbillon 30 I. The original feature of the Omega tourbillon is a very slow movement of the cage. Seven of them will be found forty years later in the archives of the brand and mounted in cases. These mechanisms are also compensated in temperature by the Guillaume balance. Unknown so far, a wristwatch surfaces as lot 182 in the sale by Phillips in Geneva on November 12. The investigation carried out by the auction house with Omega and highlighted by the specialized website Hodinkee confirms that this watch was assembled in 1947 as a prototype of which it has typical qualities : it is not embellished and remains in superb condition. Omega's success at the observatory trials in Geneva, Neuchâtel and Kew from 1947 to 1952 demonstrates the feasibility of their miniaturized tourbillon to reach the required accuracy. The commercialization project was abandoned for whatever the reason and was never disclosed. For thirty years nowadays the tourbillon has become after further improvements one of the most appreciated mechanisms in the complication wristwatches. Henri Matisse is seriously ill but has not lost his manual skill. The Jazz project started for Tériade in 1943, based on cut-off papers, maintains his creativity. The beige walls of his apartment in Montparnasse remind him of the color of the beaches in Tahiti. He cuts in a white paper the stylized forms that his assistant Lydia pins on the wall. His aim is to create two tapestry cartoons forming pendants, Océanie - le ciel and Océanie - la mer, respectively populated with birds and fish. In 1946 while Matisse was busy on this project Zika Ascher came to visit Paris. A fashion designer based since 1942 in London, Ascher usually works with Henry Moore. He now wants to edit a series of scarves prepared by a plurality of artists. Almost all of them including Matisse respond favorably. Ascher also convinces Matisse to print his Océanie. Matisse is very demanding but Ascher manages to find a linen cloth and a pigment that exactly replicate the texture and sand color of the wall. The artist's attention to the sand anticipates by two decades Agnes Martin's escape in the desert. Both artworks were edited in 1946-1947 in thirty copies each in an image format around 163 x 373 cm. The Fondation Beyeler owns the pair 4/30. The number 26/30 of La Mer was sold by Christie's for £ 2.95M including premium on June 21, 2011 over a lower estimate of £ 500K. It was then coming directly from the Beyeler estate after having belonged to the Matisse family. On April 26 in New York, Sotheby's sells the copy 20/30 of La Mer, lot 15 estimated $ 500K. Its provenance is also interesting : it had belonged to Ascher and was on loan to the MoMA from 1950 to 1953. Please watch the video shared by the auction house. Founder in 1937 of Verve magazine, Tériade was a great instigator of art. During the war, Matisse was sick. The intuition of Tériade was to appreciate that the creative impulses of the artist were intact and to convince him, which was not an easy task. His health did not allow him to paint. Matisse invented for this project a new technique by which the color existed before the creation of the form: he cut with scissors gouache layered sheets in bright monochrome colors. The result assembled by Matisse gave Tériade reason: the artist had regained the momentum and spontaneity of La Danse, painted in 1910. They had to find a title to this new hymn to joy. It could have been Le Cirque. It was Jazz. Jazz was printed in 1947 in 20 plates on 44 x 67 cm sheets. Matisse had a requirement brilliant in its simplicity: he requested that the print colors are produced by the same gouaches, strictly from the same brand, which had served for the originals. Tériade offered this set in two versions: portfolio, published in 100 copies, and book, published in 250 copies. The portfolio, when it remains complete, is more prestigious because the sheets were not bent. Now the result met the expectation : £ 410K including premium.